Another short trip to Paris. It was supposed to be one last Paris jolly before they take away my EU citizenship 😦 . It was lovely, as always, but there were issues (Brexit related). I’m trying not to dwell on those and concentrate on the good things. 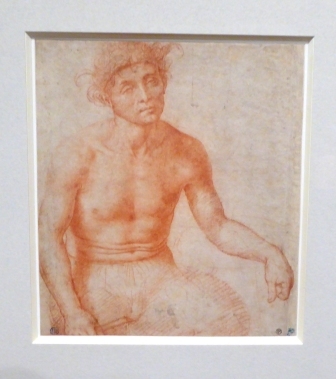 One of the good things was a small-but-perfectly-formed exhibition at Beaux-Arts de Paris, the fine arts school in St Germain des Pres; Leonardo and the Italian Renaissance. 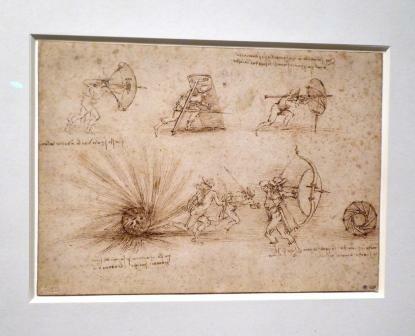 2019 marks the 500th anniversary of the death of Leonardo and many exhibitions and events are planned around Europe in commemoration. 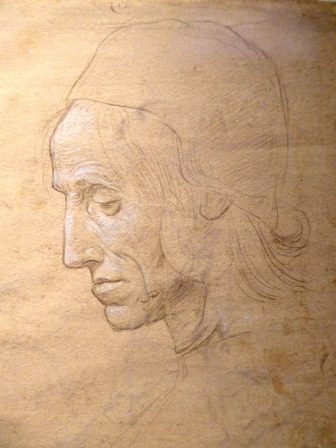 The exhibition at Beaux-Arts de Paris takes items by Leonardo and other artists of the Italian renaissance, mainly drawings and sketches, from the school’s huge collection. The exhibition is small, just about thirty items, and to get to it you have to go through the great court of the school. 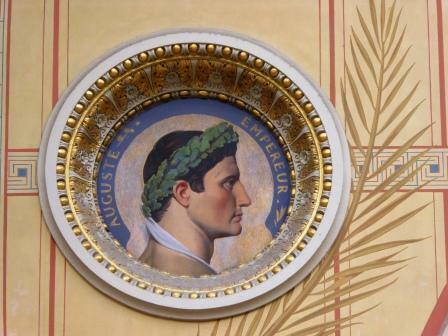 This is a magnificent space, decorated with roundels of famous persons and the names of famous artists. This is where the students show their work so there are sometimes installations here, although when I visited, it was mainly clear (it looked like something was being set up but I wasn’t sure about that). 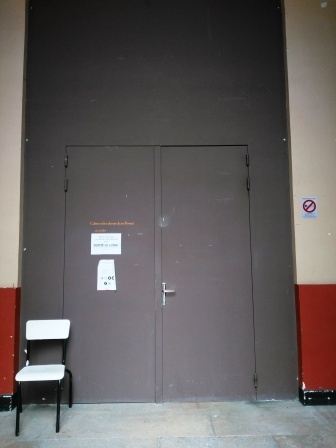 The Leonardo exhibition is in a room at one end of the court behind the least likely looking door imaginable. 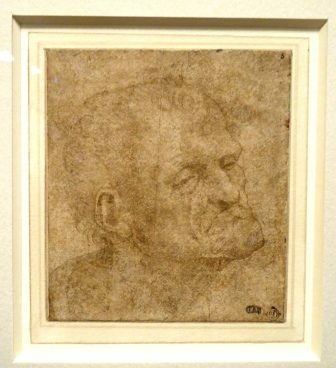 The exhibitions focuses on renaissance studio drawing, exercises and preparatory sketches for larger works, by artists including Fra Bartolemeo and Donatello. 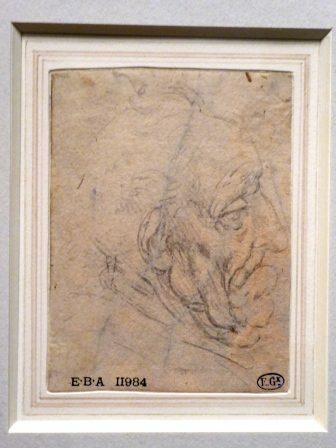 Raffaello Sanzio, called Raphael, ‘Etude pour une draperie et tet d’homme’. and his inventions of military weaponry. Bombs, shielded-pikes and bows and rolling explosives. 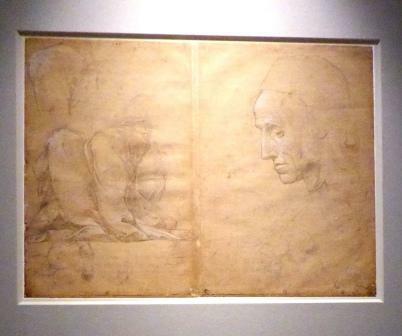 Of the sketches, I particularly liked this double-sided doodle-fest by Baldassare Peruzzi. Faces, feet, buildings, bodies. A design for a public space in Sienna. The head of a young man. 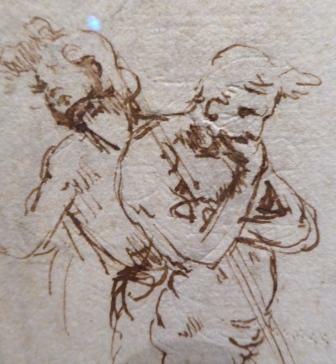 It’s always worth looking at Leonardos and, as an added bonus, this exhibition is free! Another little trip to Paris. Well, Eurostar are doing lots of cheap tickets so it’d be rude not to. On my last quick visit I had intended to take in a couple of exhibitions but, due to the yellow vested demonstrators, everything was shut so I couldn’t. Luckily, I was able to book another trip just in time to catch the exhibition at Cité de l’Architecture et du Patrimoine, ‘Le Crac des Chevaliers. Chroniques d’un rêve de pierre’. 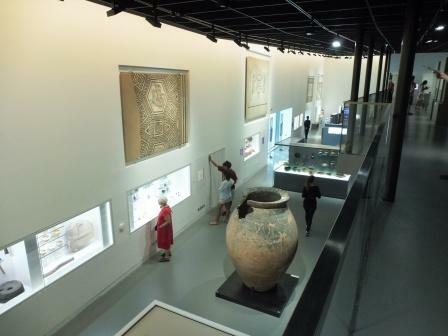 The exhibition is relatively small in size but very broad in scope, taking in the history of the site from its establishment in the first half of the 12th century, through to its ‘rediscovery’ in the 1920s when Syria was under the French Mandate, down to the present day as an important heritage-at-risk site. Its earliest years, as a home to the Knights Hospiteller, the crusader castle, on which construction began in 1142, was built on the site of an earlier settlement of Kurdish tribesmen under the Emir of Aleppo and Homs, Shibl ad-Dawla Nasr. 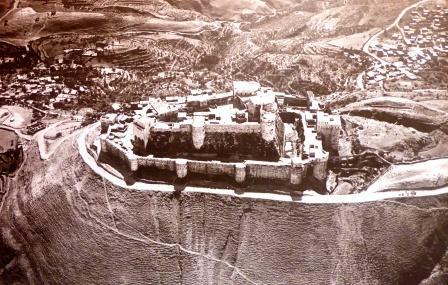 The site was then known as “Ḥiṣn al-Safḥ” but later became known as “Ḥiṣn al-Akrād” (Castle of the Kurds). 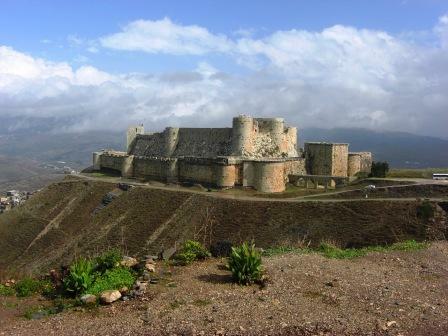 The castle underwent many modifications during its lifespan as a crusader castle, sometimes due to changes in fashion, due to damage from earthquakes, floods and droughts, and due to the changing defensive demands of the site. Eventually in March 1271, after a siege lasting almost a month, the outer parts of the castle were taken by Mamluk forces. The Crusader Knights retreated into the inner ward but, after 10 days, they were persuaded to leave when the besiegers delivered a, possibly forged, letter of permission to surrender from the Grand Master of the Knights Hospitaller in Tripoli. The Knights were granted safe conduct and the new, Mamluk, owners converted the castle for their own needs (including converting the chapel into a mosque). Several 19th century explorers described and recorded the castle, and it was included in guidebooks of the east and Holy Land but it gained a new audience when in 1926, on a visit as part of the International Congress of Syria and Palestine, Paul Deschamps first saw the castle. In the intervening centuries, a village had grown up within the walls and up to 500 people lived in and around the site. The underground vaults were choked with detritus of human habitation. Deschamps recognized the site as important and tried, unsuccessfully to persuade the villagers to move out so that it could be conserved. When the villagers proved unwilling to give up their homes, he then hit upon the idea of persuading the French colonial government to purchase the castle from the government of Latakia (the Syrian provincial government responsible for the site). The French government agreed and November 1933 it paid one million francs for the site. Clearance and restoration work was conducted between 1934 and 1936 but then, after the Second World War, due to the questionable legality of the earlier sale the, now independent, Syrian government had demanded, and been granted, the return of the site. Crac des Cevaliers was restored to the Syrian government in February 1949. The site was cleared and renovated by Deschamps, using soldiers garrisoned there as labour. 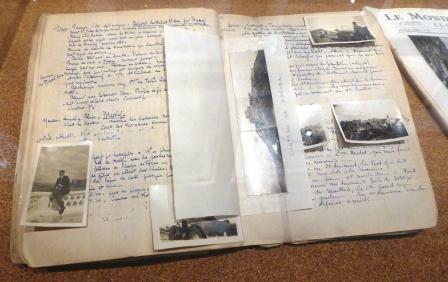 Duchamps’ notebooks describing this process survive, along with snaps he took on his many visits to the site. This is how the internals view looked when I visited in 2010. 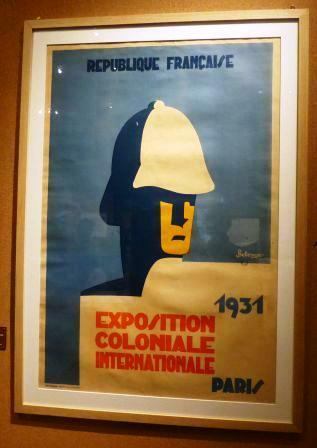 The exhibition includes posters and artefacts relating to the French Mandate period when travel and tourism to Syria and Lebanon were being marketed to French travelers. The Holy Land in these images is exotic and glamorous, but also with an adventurous slant. Very colonial. Highlights of the exhibition are the maquettes, the largest a detailed [scale???} 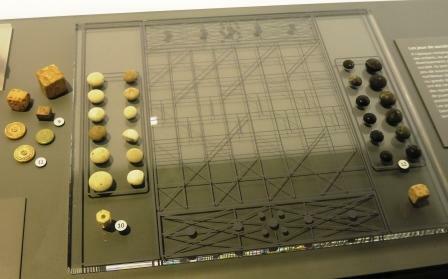 model of Crac des Chevaliers created for the International Colonial Exhibition in Paris in 1931. The model was created by Etienne Prevost and shows the condition of the castle in 1930, before restoration began. 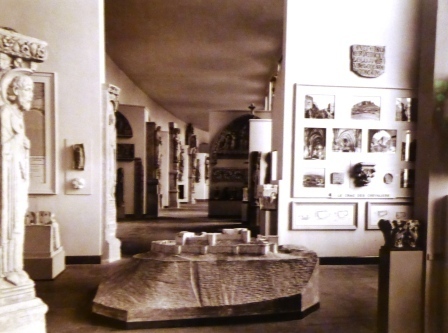 Here is a view of it in the 1931 exhibition. In 1928, Duschamp also had casts made of the castle’s architectural elements inscriptions. 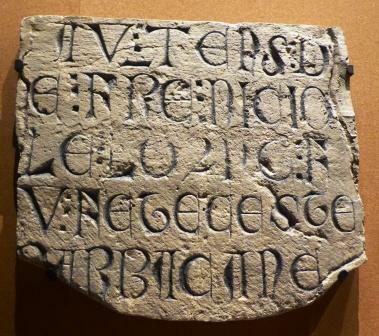 This cast is of an inscription commemorating the work carried out at Crac in the mid-13th century. Be wealthy, be wise, be beautiful, but beware of pride, which blemishes all it comes near. There is actually something dreamy about Crac des Chevaliers. Perched on its own mount in the Homs Valley, the views of the castle are spectacular and, before the current conflict, a visit to Syria just wasn’t complete without a visit to Crac. The viewpoint from the road overlooking the valley (top) is the classic view of the castle and road with steep drops and hairpins bends means that the drive up to the castle itself is pretty exciting. From the citadel itself, there are dramatic views down the valley. Unfortunately, the events of recent years have not been kind to Crac, which was occupied by armed groups in the summer of 2013 and sustained damage in bombardments over the next 9 months or so. 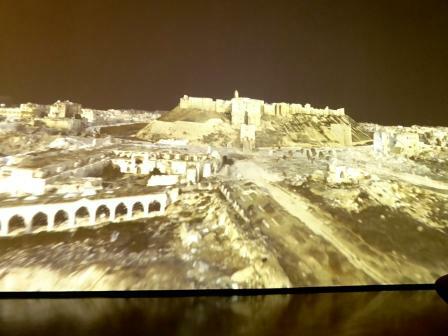 Ongoing work being carried out under the auspices of Unesco includes recording using digital technology to produce 3-dimensional digital plans of the site. Hopefully, this detailed work will help with both the Syrian and international conservation efforts. ‘Le Crac des Chevaliers. Chroniques d’un rêve de pierre’ is at Cité de l’Architecture et du Patrimoine, and the run has been extended until 4th March. Just a super-speedy flying visit, but it was nice to be there all the same. But the trouble with super-speedy flying visits is that, no matter how nice they are, they always leave you wanting more. There’s just not enough time to do everything. 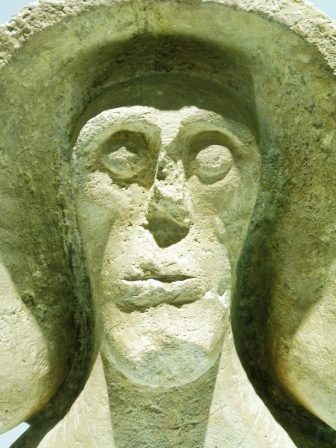 I mean, I need to get to Musee Cluny to see the new entrance and walkways around the thermes, and for the winter expo, Naissance De La Sculpture Gothique. 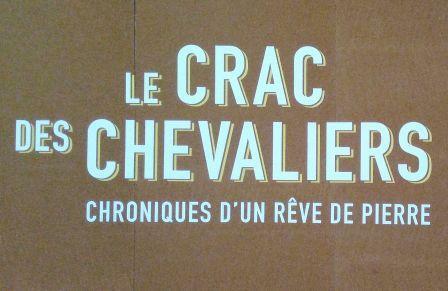 There’s also an exhibition at Cité de l’Architecture et du Patrimoine, Le Crac des Chevaliers. 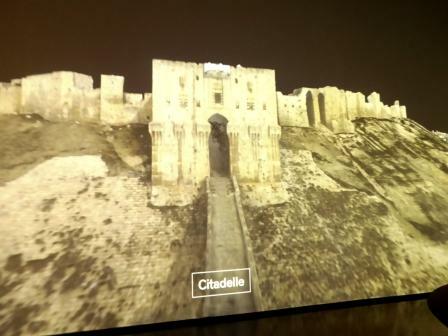 Chroniques d’un rêve de pierre, examining the architectural and political significance of the Syrian crusader castle, Crac des Chevaliers. 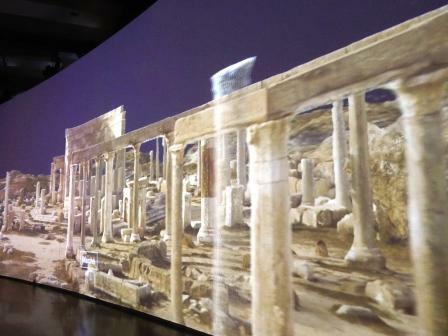 But, in the end, the short time that I had just had to be spent at the brilliant Institut du Monde Arabe for the exhibition Age-old cities: Virtual trip from Palmyra to Mosul. The exhibition takes in four ancient and modern cities affected by recent and ongoing conflict, and presents aspects of them as they are, as they were and as they may be in the future. This is not an exhibition of artefacts but of images. Using photographs, films and photogrammetric survey footage, taken using drones (carried out by UNESCO), we get a view of the cities as they are today. The use of drones, in particular, reveals the significant damage, destruction even, of whole swathes of the urban environment, with deserted, bombed-out buildings apparently teetering on the brink of collapse and the still-inhabited areas thick with dust and debris. As I’ve been to three of the places featured in the exhibition, I’ve added in a few photos of mine, taken on my visits. 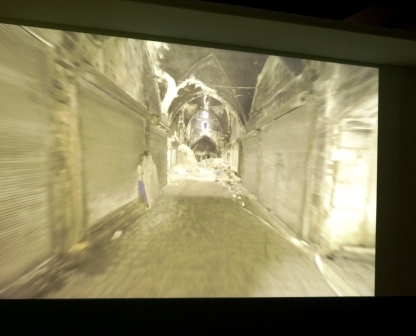 Some of the other photos,which were taken in the exhibition, are a bit blurry, as they’re of moving images. The exhibition opens with Mosul, a city which I have never visited. On entering the first main exhibition space, I walked into a large-scale panoramic projection of a fly-over of the city as it is now. Now, I’ve seen plenty of drone footage of areas affected by the ongoing conflict but, particularly on a such a large scale, these images of destruction are truly shocking. Sitting on the west bank of the Tigris, opposite the Assyrian city of Ninevah, and around 400km north of Baghdad, Mosul has existed as a settlement, at this location or hereabouts, for at least 2500 years (Ninevah is far older). Capture by daesh on 10th June 2014 and only retaken by Iraqi forces, after heavy bombardment, on 21st July 2017, Mosul and Mosulis have suffered terribly as a result of the conflict in Iraq, with women and religious minorities particularly badly affected. The city had been known as relatively diverse, with the Iraqi Sunni Muslim majority sharing the city with Assyrians, Kurds, Turkmens, Shabaks, Yazidis, Armenians and Mandeans. Although many of the city’s Jews left for Israel in the 1950s, there was still a significant Christian population until the arrival of daesh in 2014. One of the specific structures zoomed in on was the al-Nuri Mosque. Famous for its leaning minaret (possibly due to the effects of thermal expansion caused by the sun’s heat), the mosque was the focus of pilgrimage and veneration for 850 years. It was the site at which the daesh leader, Abu Bakr al-Baghdadi, self-declared the (so-called) “caliphate” and the daesh flag was flown from the minaret. The mosque was destroyed during the Battle of Mosul in 2017, although there is some disagreement over whether it was destroyed by daesh or by the forces liberating the city. Still from drone footage of the al-Nuri Mosque, Mosul. There is really very little left of the mosque, just the ruin of the domed central hall and the stump of the famous minaret. All the rest is rubble. 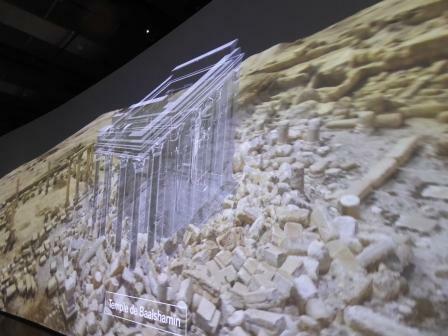 As part of the film, we witnessed the digital ‘reconstruction’ of the site. These images are built up using recent photographs from all angles, often people’s holiday snaps (I actually sent some photos of a site in Syria for exactly this purpose), which are digitally stitched together to create a 3d image. 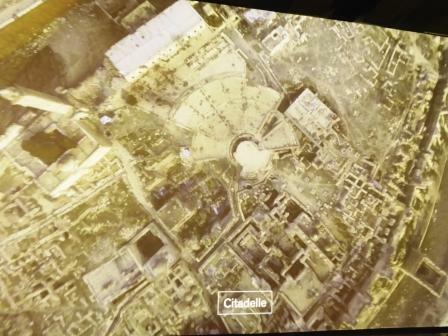 Still from drone footage of the digital reconstruction of the al-Nuri Mosque, Mosul. Aleppo Citadel. Photo taken 5th November 2009. …and up the ramp to the Citadel. This really brought back memories of my time there, when it looked very different. Aleppo Citadel. Photo taken on 5th November 2009. The walls of the Citadel have clearly sustained damage, and it looked like parts of the interior space had too, although I found it a bit difficult to orient myself in this complex site. The section on Leptis (Lepcis) Magna was less of an agony for me. Although there has been some illegal digging and looting at the site, local residents, working in militias, have tried to stave off the worst of the lawlessness, and there hasn’t been the kind of occupation or intensive bombardment that we have seen at the other sites showcased. The images I saw looked pretty similar to the way that it looked when I was there 10 years ago. The ancient structures are partial and the site is, largely, a ruin, albeit a very impressive one, but there weren’t obvious signs of recent extensive damage. Nevertheless, the fly-through of the macellum (marketplace) and the virtual reconstruction of the Severan Basilica was pretty impressive and provided a little respite before the final key site featured, one which I knew I would find hard to witness. Temple of Bel, Palmyra. Photo taken 8th November 2009. When I visited Palmyra, and the modern town Tadmur, in late 2009, it was an impressive, pretty well kept ancient site. The main site itself was open for visitor to wander in and look around and it was possible to wander pretty far, as it’s a very large site. Several of these tombs were destroyed and/or damaged by daesh in 2014/15. One of the other notable instances of willful vandalism was the dynamiting of the Temple of Bel (above) and I found myself feeling particularly sad at the images of the theatre and the Temple of Baalshamin, when I found myself standing, virtually, in the rubble of the building. This was a building in which I had stood, gazing at the beautiful decorative friezes and the carved columns, and thanking my good fortune at having the opportunity to be there. Temple of Baalshamin, Palmyra. Photo taken 8th November 2009. But I couldn’t help but think past the structural damage and the willful and shocking destruction of the ancient temples, to the devastation wrought on the people living in the modern Palmyrene town of Tadmur. I couldn’t help thinking about the people murdered by daesh in the theatre, including Palmyra’s Head of Antiquities, Khaled al-Asaad (January 1932 – 18 August 2015). 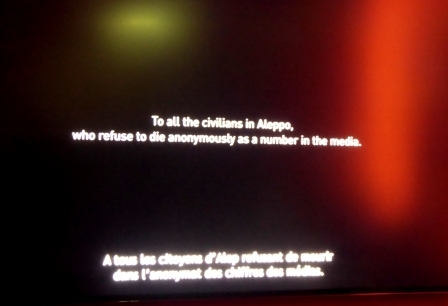 Throughout the exhibition there are short films, talking heads and personal accounts of the effects of all of this destruction on the people living in these cities but, particularly as a visitor whose French is a bit shaky, the focus of the exhibition really is on the effects of conflict on the built environment. The images recorded by drones are largely devoid of people, the streets thst I remember as bustling and busy with the usual comings and goings of the city, are eerily empty of life. 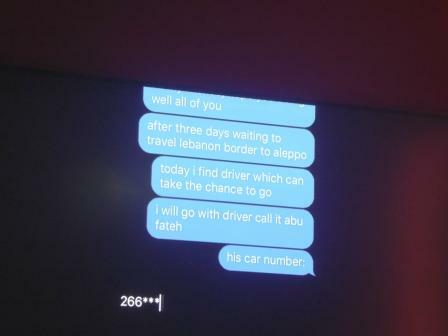 A notable exception is a short film documenting the filmmaker’s return to Aleppo to speak with the people still living there. He meets the shopkeeper who, despite being surrounded by the dust and debris of countless explosions, still diligently cleans his stock before putting it on display. And there’s the young woman recording a video message on her phone, to send to her sister, who is not in the city. The young woman doesn’t say anything of any importance, just chats and reads the news and laughs and hopes that she will still be alive tomorrow. 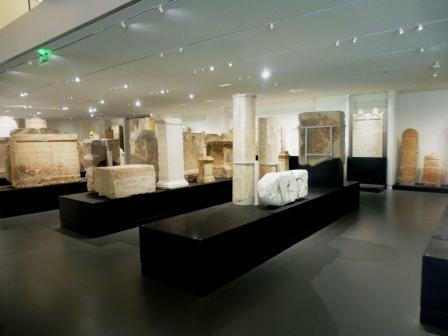 The exhibition ‘Cités millénaires Voyage virtuel de Palmyre à Mossoul‘ is on at the Institut du Monde Arabe until 10th February 2019. *I had the tombs all to myself except for the small child who chased after me for about half a mile asking for sweets. I had no sweets with me so I gave him a pen. He seemed satisfied with this alternative. I wonder where he is now, and I hope he’s ok. The Netherlands is home to some cracking museums; the Rijkesmuseum, Rijkesmuseum van Oudheden, Allard Pierson, the museum at Castellum Hoge Woerd and many more. But I’ve never been to the north of the country, so I had no idea what was up there. 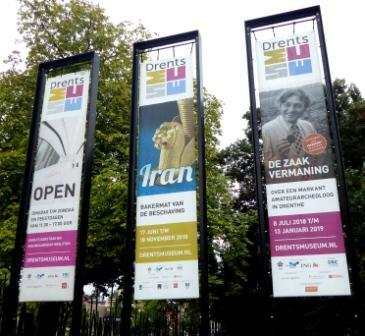 That is, until, a Twitter post by @FollowingHadrian about an exhibition of Iranian (Persian) archaeology and artefacts at the Drents Museum in Assen. As I’m always on the lookout for exciting things of an archaeological to do and see, and as I was actually due to be in the Netherlands (albeit much further south) over the August Bank Holiday, I immediately set about working out how I could fit in a very quick trip north to have a look. Artefacts in the exhibition were on loan from the excellent National Museum of Iran, which I visited when I was in Tehran in 2015, so I was very keen to get another look at them. As well as artefacts that I remember seeing, there were ones that were either not on display, or which I just didn’t see or notice, so there were plenty of ‘new to me’ things to see. The Drents Museum was purpose-built as a museum in 1854, but the exhibition was in the newer extension, opened in 2011. The exhibition space, downstairs, is quite large, although not huge, open and nicely lit and there seemed to be a good number of people visiting the exhibition, including groups, although it was not packed (this was a Monday* lunchtime, so I wouldn’t have expected it to be really packed). 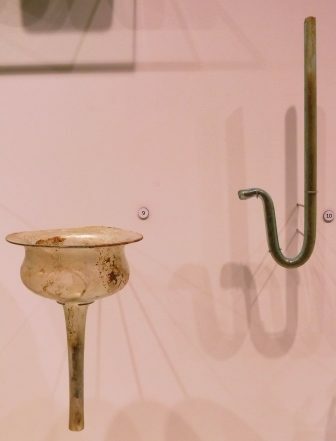 The exhibition, Iran: Cradle of Civilisation, takes in a really broad sweep of Iranian/Persian history, including prehistoric artefacts dating from as early as 7000BCE right into the Islamic period, ending in about 1700CE. 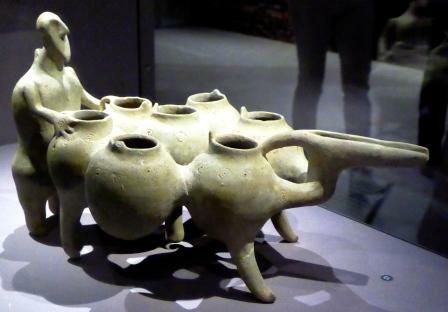 Prehistoric culture is represented by some really beautiful and delicate pieces. 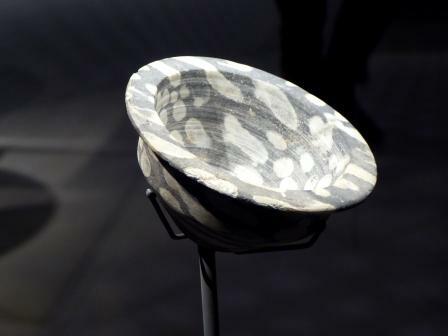 I was particularly struck by this small stone bowl (it’s about 4-5 cm in diameter). It’s carved out of a piece of the darker-coloured stone in which there are lighter bush-coral inclusions. This terracotta bowl is decorated with a painted frieze of dancing figures. Perhaps commemorating a particular occasion or a festival of some sort. 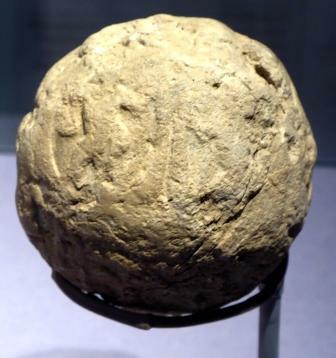 I was particularly fascinated by this clay ball, as it brought to mind the stone balls seen in collections in the north of Britain (have a look at the Huntarian Collection in Glasgow for some examples). Clay Bulla, 3200BC, Susa, National Museum of Iran, Tehran. It isn’t really known what the balls found in Britain were for but the accompanying film explained this Persian ball. It’s a seal! The ball is covered with figures of human and animals. I stood in front of the screen filming the whole video because it really explained this artefact very well. You can see the video here: Clay Bulla (message to anyone from the Drents Museum: If you would prefer it if I took this video down, please let me know and I’ll do so). 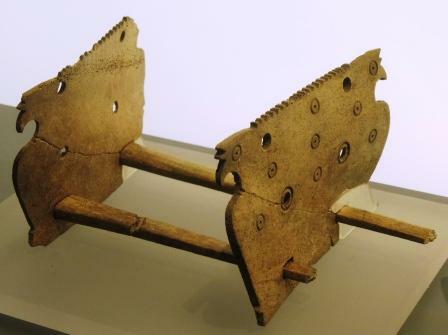 The two objects below, although not particularly fancy looking, are evidence for the technological development of the region. 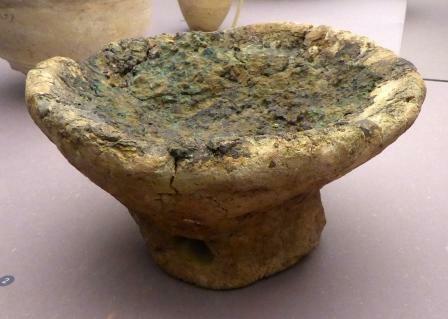 The first a rather mucky-looking footed-dish, is actually a crucible in which copper was smelted. 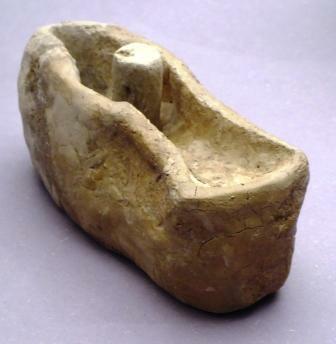 Clay crucible 4000-3700BC, Tappeh Qabrestan, National Museum of Iran, Tehran. When copper ore is heated to a temperature above 1084c it will melt and can then be poured into moulds. At first only pure copper was melted, but the coppersmiths gradually started to mix it with other metals. One of those experiments lead to the discovery of bronze (copper and tin). The second, a mould for casting a copper axe-head. Found at the site of Tappeh Ghabrestan, northwest of Tehran, which is know for its finds associated with copper-working, with furnaces and moulds dug into the ground as well as these smaller, terracotta moulds. Although these not the fanciest exhibits in the exhibition, they are hard evidence of technological development and expertise in the region. So what are the fanciest artefacts? From the third millennium BCE, comes a gorgeous selection of carved soapstone vases, pots, cups and bowls. Soapstone is soft and relatively easy to carve, so it lends itself to these kinds of intricate, detailed designs. The imagery include real and imagined creatures, demons, deities, scroll-work and complex, interlocking geometric designs. I spent a long time admiring these wonderful artefacts and wanting so badly to be able to touch them. From the 6th until the 3rd centuries BCE, the first Persian empire, the Achaemenids, founded by Cyrus the Great, dominated this part of the world. This dynasty, which included the other Persian ‘Greats’, Darius, and Xerxes, is notable for, among other things, its fine gold work. Examples in the exhibition also include beautiful vases and drinking horns (rhyton). Gold cow, 559-331BC, Hamadan, National Museum of Iran, Tehran. Gold rhyton, 559-331BC, Hamadan, National Museum of Iran, Tehran. Pottery jug 850-550BCE, Kaluraz, National Museum of Iran, Tehran. This jug appears to have a spout in the shape of some kind of beak. Such beaked jugs were used for special wine ceremonies at burials. The Kaluraz cemetery is well known for its beautiful pottery vessels. This is the finest example – functional and yet artistic. 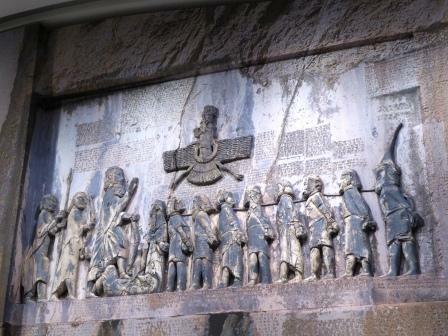 And there were even some reliefs from the imperial city of Persepolis. Relief, 559-331BC, Persepolis, National Museum of Iran, Tehran. Many reliefs at Persepolis show representatives of the 23 peoples of the empire, who came to the imperial city to pay tribute to King Darius. on the left, a gift-bearer climbing the stairs and on the right, a ma presenting a gift of arms to the King. 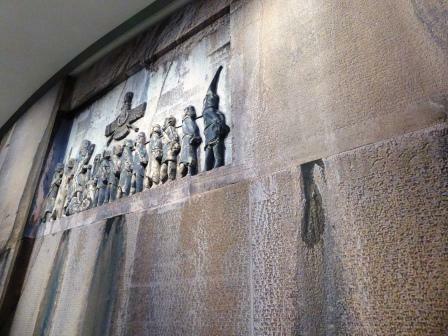 A whole wall of the exhibition space was transformed into a famous and spectacular monument, the original of which is situated at the World heritage Site of Behistun in north-west Iran (there are several spellings of this: Bisotun, Bistun or Bisutun). 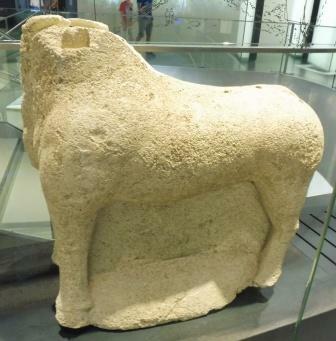 The life-sized figure holding a bow, as a sign of kingship, is Darius the Great, beneath his foot is a figure, possibly the pretender to the throne, Gaumata. Behind him are two attendants and facing him are bound captives representing the conquered peoples. The symbol above the scene is the Faravahar the central symbol of the Zoroastrian religion. The text, is written in three ancient languages; written in three different cuneiform script languages: Old Persian, Elamite, and Babylonian (an Akkadian dialect) and it provided the key to the decipherment of cuneiform, in much the same way the The Rosetta Stone was the key that unlocked Egyptian hieroglyphs. The inscription begins with the biography of Darius the Great, for whom the monument was created, and the history of the empire following the death of its founder Cyrus the Great. It describes the battles fought and won, and the rebellions put down by Darius and the generals subjugated. This life-sized replica, measuring 15 x 6 metres, was created especially for this exhibition and installed at the same height as the original would be viewed. This gives a good idea of how the original in-situ would be seen, although, obviously, in a very different location. Gold applique, 2200-1700BC, Tappeh Hissar, National Museum of Iran, Tehran. This is certainly one of my exhibitions of the year and I would love to visit again, but I doubt that I’ll be able to get to Assen again before the exhibition closes on 18th November. However, I think I’m going to have to plan a return visit to the Drents Museum in the not-too-distant future, for the next exhibition, ‘Nubia – Land of the Black Pharaohs‘ I just wish that exhibition catalogue was available in English. If it had been, I would have snapped it up. *I should say that the Drents Museum, just like pretty well every other museum in the Netherlands, isn’t generally open on Mondays. I was lucky in that I was visiting at the end of the school holidays and it happened to be open on the day that I was able to get there. On a flying visit to Paris I decided to take in a couple of places that I’ve never been. One of those places is a church in the 14th arrondissement. Paris is full of churches, of course, but this one is a bit different. Ok, it doesn’t look very different. In fact, it looks pretty conventional. But wait till you see inside. It’s not really a stone building at all. It’s steel frame construction with just an outer cladding of stone. In the mid-19th century, the population of this Paris district grew rapidly, quickly outgrowing the existing church. These were working people, many working in construction, but also many poor Parisians. Taking advantage of the interest in Paris’ 1900 Universal Exhibition, the parish priest, Father Soulange-Bodin, started a subscription to raise funds for a new parish church and the church that was built, L’eglise Notre Dame du Travail, Our Lady of Labour, was consciously designed, by the architect Jules Astruc, to reflect the lives and livelihoods of so many of its parishioners. Overtly industrial in its design, the nave is built over a steel and iron framework. This, in a way, reminds me of Tower Bridge. It’s so deceptive. On the outside it’s all stone, traditional, old-fashioned even, but on the inside it’s all modern (for the time) materials and construction techniques. And the modernity of it, the engineering, isn’t covered up or disguised, but displayed and celebrated. 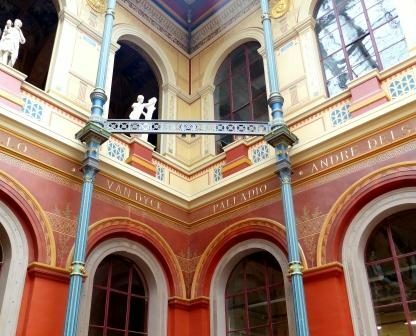 Some of this was reused metalwork, having previously been used in the construction of the Palais de L’Industrie, which had been built on the Champ de Mars in 1855 for an earlier Universal Exhibition . Even the artworks inside the church reflect the world work work. Saint Luke, the Evangelist, venerated as a patron saint of artists, physicians, surgeons and butchers; Saint Eloi (Eligius), patron saint of metal-workers and those who work with horses; and Saint Fiacre, the patron saint of gardeners. 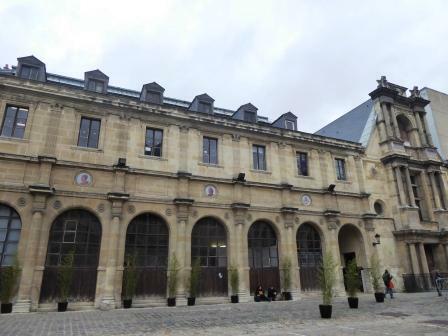 The church can be found in the 14th arrondissement in the district of Plaisance (nearest metro: Pernety on L 13. Roman Nemausus grew out of a earlier, iron-age settlement on Mont Cavalier, which was repurposed as a Roman town in the years before about 28BCE. Early coins indicate that the town was a colonia and it was made the capital of the province, Narbonne, by Augustus in about 16 to 13 BCE. 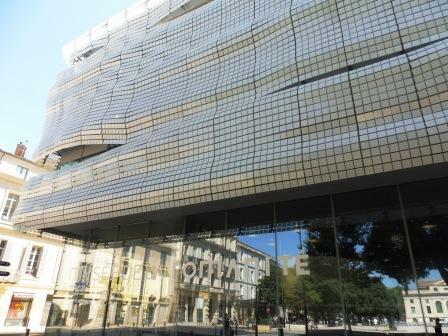 The shiny new Musée de la Romanité is the new home for the archaeological collection of Nimes which had previously been housed in the old museum, which (I think) was part of the University. I saw some of the collection there about three years ago but even then the museum was only partially open and there was a lot that I was unable to see. So having (finally!!) arrived in Nimes, I headed straight for the museum without further delay. The collection spans the history of the city from its early, iron-age, incarnation and through the Roman period. Rather than an exhaustive trawl through everything in the museum, I’ll just highlight a few of the objects and displays that I particularly liked. 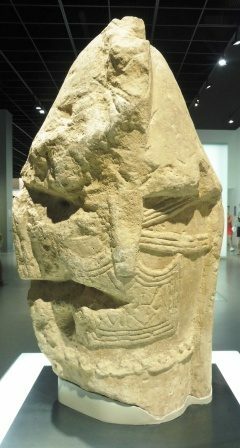 Representing the iron-age are these gorgeous stone warriors. Interesting details include the breastplaate with its strapping, the torque around his neck, his sunburst medallion and what looks like a chain or rope around the waist. Also note the long tail of the helmet crest. This very stylised statuary is very different frrm the later, much more naturalistic classical style, but presents the Gaulish warriors as proud, strong and well-equipped. Displaying the busts in the round means that it’s possible to really see all the fine details of the armour and acoutrements, and then compare the detail from the busts with other objects on display in nearby cases. 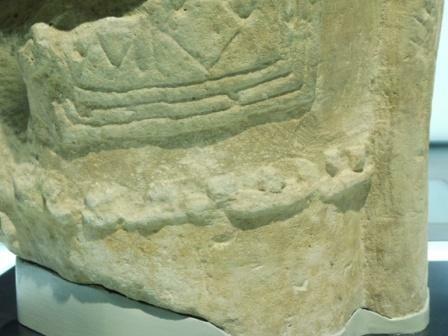 The incised design on the Ste Anastasie (above) warrior would have been painted in bright colours, and the huge helmet that he wears, possibly made of leather in real life, is decorated with rams’ horns. 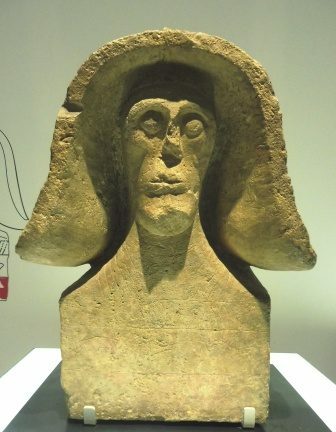 It was very good to see these examples of pre-Roman Gaulish statuary and to think about how warriors, of the kinds who would have battled against the Roman forces, were representing themselves. And these were urban, or at least proto-urban people, living in fortified towns as in the model of the town of Castels at Nages, below. This was one of the largest Gaulish towns in southern France. Built in the third-century BCE, it consisted of identical, stone-built houses, tightly packed in blocks and, by the first-century BCE, surrounded by substantial ramparts. It declined and was abandoned as the Roman administration took control of the region, and the people moved into newer, Roman-style towns. 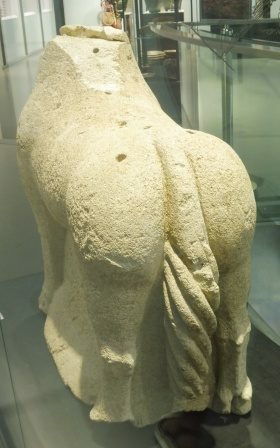 From the iron-age, there is also this cracking horse/bull/animal/thing. Animal hybride decouvert sur le chantier de fuilles de villa Roma (1990). Epoque pre-Romaine (?). This hybrid creature has, more or less, the body of a horse with the hooves of a bull. It’s clearly a special creature as its tail has been twisted into a fancy coiffure. 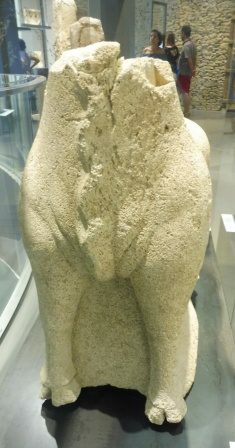 the holes in its back were probably fixing points for decorative elements such as wreaths or horse-furniture (saddle, reigns…that sort of things). 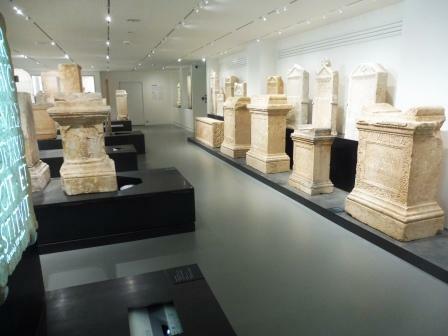 As Nimes is a city with a number of Roman structures still standing, it’s unsurprising that the museum features artefacts that relate directly to those structures; the amphitheatre, Maison Caree, and the Temple of Diana, are all represented in the museum. This is great for visitors and locals alike and really helps to connect the exhibits in the museum with the city outside. I’m a big fan of the display of decorative architectural elements, from various sites around the town, depicting theatrical mask. I was very impressed with this large decorative frieze of garlands and ox-skulls. Elements d’un frise dorique. Premier moitie du 1er s. ap. 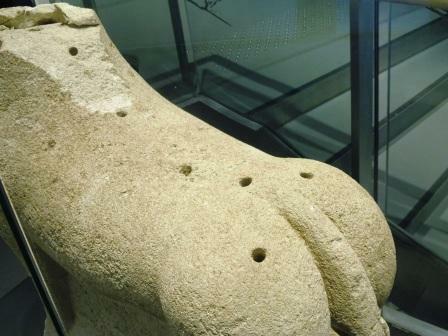 J-C. Calcaire Nimes, quartier du quai de la Fontaine, XIXe – XXe s.
The holes in the ox skull reminded me of the skull found at Vindolanda that had been used for target practice but these holes were probably to hold decorative elements like garlands and ribbons. Some of these architectural elements are originally from early Roman buildings but were reused, in antiquity and later, to decorate buildings in the town. 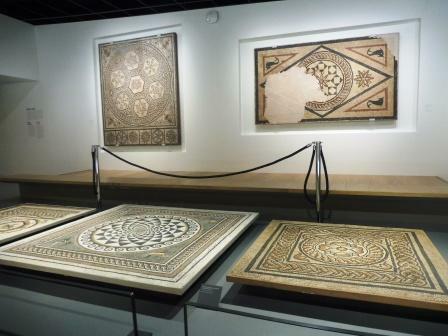 There are some nice mosaics on display in the museum, and there is a good view of some of them from the mezzanine level. 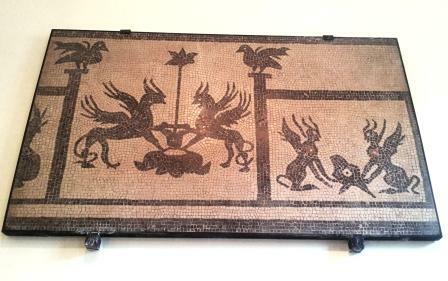 I particularly like this mosaic carpet with the monochrome swimmers in the border. Mosaique aux nageurs noirs, fleuron et svastikas au centre, rinceau et postes en bordure. 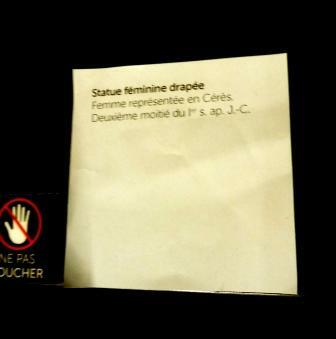 Troisieme quart du 1er s. av. J_C. Nimes, face a la Maison Caree, 1992. There was one in the old museum that I particularly liked but which I didn’t see in the new museum. It’s not impossible that I just missed it due to hurrying but I do hope it goes on display if it isn’t already. The last time that I was in Nimes, about three years ago, I’d visited the museum that was connected with the university, which was home to the Roman collection at the time. Barely noticeable in one of the cases was a particular die, which I spent some time trying, and failing, to get a decent photo of. When I visited the new museum, I went in looking for this specific die. 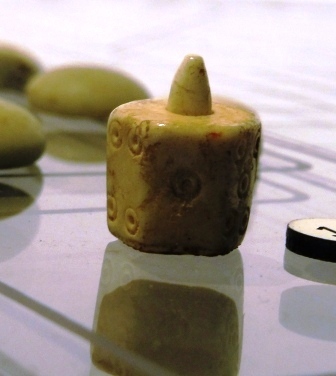 This particular die is a sort of hexagonal drum with a hole in one end and a lug on the other. The numbers (pips) are on the faces that run around the drum. As far as I could see, the numbering is regular, i.e. opposing faces add up to 7; 1>6, 2>5, 3>4. When I saw it before, I was wondering how it was used, and about the significance of the shape. I think that I’d decided that it was one of a set which fitted together in a row, lug to dimple, and could be spin around. They reminded me of those stacker pencils that kids have. Has anyone seen any others like these anywhere? As well as the above die, this case had a complete set of gaming counters and several other very nice dice. There was also this object. I had no idea what it was until I read the caption. It’s a papyrus roller! There was this glass funnel and syphon. The syphon, in particular, struck me as a remarkable survival. I was also intrigued by this reconstruction of a portable fireplace, with utensils. 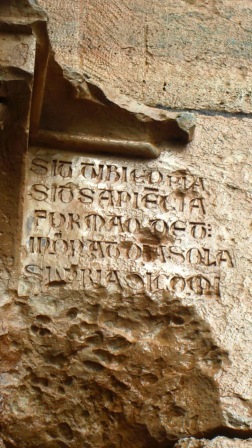 Dating from the 1st century CE, it was found during excavations of courtyard house 11 at the ‘Solignac / Villa Roma’ site. It’s made of a central bed made of bricks, set into a frame, probably made of wood, but long-since disappeared. The reconstruction is based on the various metal fixings and findings that were excavated; nails, laths and clamps. The utensils found were tongs, a knife, a tripod and a grill. Lastly, I also liked these plumb-bobs. No particular reason, I just liked seeing them. That’s all for now. Pip pip. 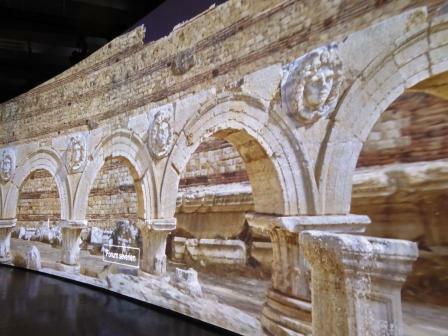 I’ve been looking forward to the snazzy new Roman museum in Nimes for as long as I’ve known it was going to be a thing. It opened in early June so on my latest little trip, to Arles, I made a point of heading to Nimes to take a look. The French rail company SNCF earned my everlasting enmity by cancelling my train, meaning that I arrived in Nimes a full 2 hours later than I should have, so my time was a bit more restricted than I would have liked and I actually ended up having to charge round the last bit in order to get back to the station in time to catch my train back to Arles (of which, more later). 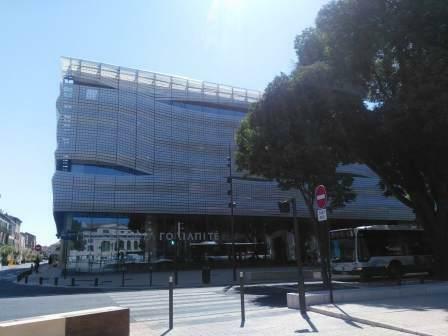 Anyway, here’s the new Musee de la Romanite in all its glory. I read that the design, by architect Elizabeth de Portzamparc, was, in part inspired by the idea of the fabric of the toga, with ripples and folds of glass panels reflecting the light and the shade, and bringing movement and interest to what could be a boring, bland glass-box exterior. 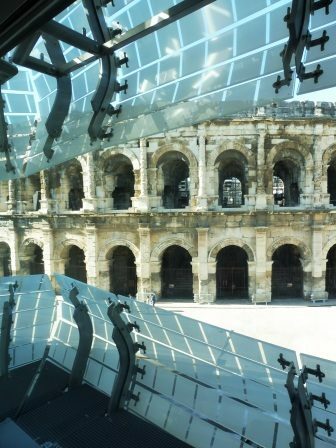 including the highlight view of Nimes’ 20,000 seat Amphitheatre. 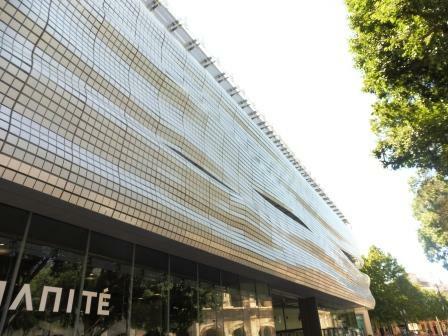 I enjoy the visible engineering on the inside (see also the Institute du Monde Arabe in Paris). A the entrance, the museum begins with a spiral up to the pre-Roman Gaul collection. The museum has lots of small-ish spaces and several bigger spaces and I must admit that I found it a little bit confusing trying to work out which space to go into next in order to follow the galleries more or less chronologically. Maybe it doesn’t really matter, it’s just that I did have a few “where next?” moments, although these might just have been on account of my eagerness to see the things that I was glimpsing through the entrance-ways between the rooms. I can’t say that that spoiled the visit but I did have to hurry at the end when I discovered that I’d missed out a whole gallery! Luckily it was a small gallery so I just about had time to have a look before running off. There are a few signs that seem to be par for the course with newly opened exhibition spaces. That sense of things being not quite finished in time for the scheduled opening. Some of the labels were clearly temporary. There may have been the odd balustrade missing. Certainly, a proper rail would be better than ropes here. Some of the spaces between furniture are too narrow. I saw a man with a pretty normal-sized pushchair unable to get past a bench. There was an alternative way around but I do think that, in a brand new building, either the gap should be wide enough (for a wheelchair actually) or there should be no gap at all and we all just go the other way. TBH, if they just moved the bench, that’s problem solved. 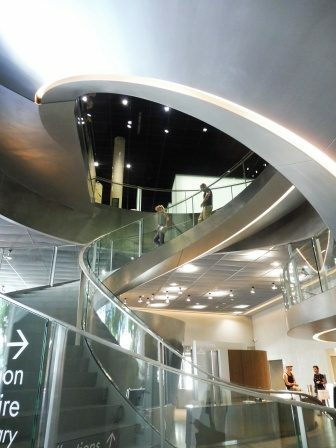 The staircase down to the lower ground floor temporary exhibition gallery is pretty bleak, like those staircases you have to go down when you’re boarding a flight, grey, lifeless, empty. It could do with a few images or something, to liven it up a bit. But that’s the niggles out of the way and I think that all of these things are just tweaks to be made as the new museum beds in. Now for some of the cool stuff. As I said above, I do like the design. It’s modern but not lary or obnoxious. Due to the evil fiends at SNCF, I really didn’t have enough time to investigate all of the spaces; there is a garden somewhere (on the roof?) 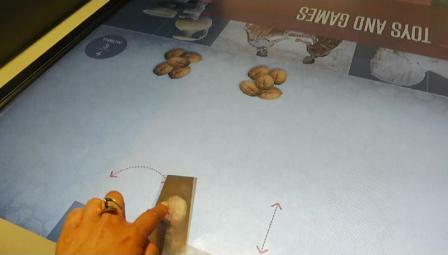 and the expected cafes and a shop. This isn’t a disaster for me as it gives me more aspects of the museum to discover when I revisit. I will be revisiting. Some people apparently think that models in museums are cheesy. I am not one of those people. 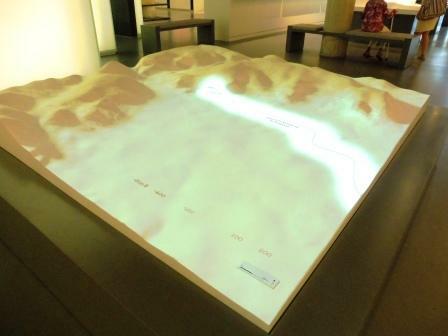 There were models of the landscape, of the city, of individual structures, of types of artefacts. I like this landscape model onto which the development of the city and its changing layout are projected. It’s not a complicated idea but it really helps to see the Roman city in its landscape context. Museums are, inevitably, full of stuff that must not be touched, but I’m fond of museums that also incorporate some stuff that you can touch to your heart’s delight. Click the link and you can see me winning with walnuts. The museum has a range of films about aspects of the collection and about the conservation of particular objects. My favourite was the one about quarrying 😀, which demonstrated how Roman quarrymen (often slave or convict labour) removed blocks of stone from the quarry face using hand tools and wedges. There’s a definite emphasis on placing objects and architectural elements into their proper contexts. Where did they come from? Where were they found? Which buildings are they associated with? How were they used? 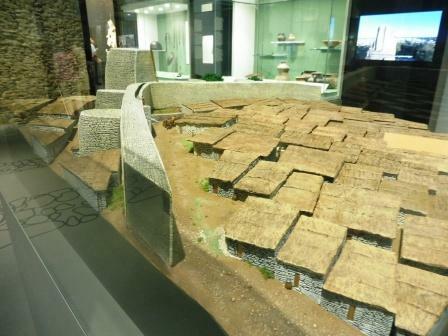 The models and films really help with this, moving the artefacts from being just stuff in display cases to actually being part of everyday life in the Roman town. 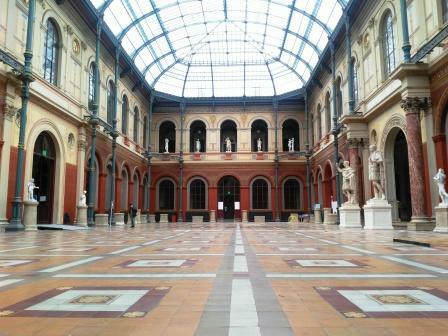 Despite being big and expensive-looking, the Musee de la Romanite feels like a local museum. 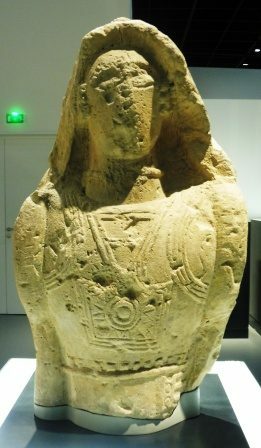 I got the impression that quite a few of the visitors were locals, as I kept hearing exclamations of recognition from people looking at artefacts, particularly in relation to key local landmarks like Maison Carrée and the Temple of Diana. People did seem genuinely interested. There were a lot of people watching that quarrying film, maybe, in part, because it related directly to the restoration of the Maison Carrée. This post is getting too long so you’ll have to wait until the next one for the artefacts but I’ll just whet your appetite with a few. Suffice it to say that the museum takes in a wide range of object types; building material; pottery; metalwork; statues; glassware; mosaics; the lot. Having charged round the last bits of the museum and, literally, run to the station, I found that my train back to Arles was delayed by an hour. *shakes fist and calls down the curses of the gods*.